Photo Courtesy: The Huffington Post. By now, half of the world who know and care about Steve Jobs already know that he is no longer among us. It’s either his deadly disease or cruel fate that took him away from us. My Google+ stream is blown away with all types of activity related Steve Jobs’ death. People in my Facebook feed are quoting many things Steve Jobs once said, most of those were from the Stanford Commencement Speech in 2005. Many people, who aren’t into technology and doesn’t know much about Steve Jobs are wondering why people are so sad because of Steve Jobs’ death. He is no longer the CEO of Apple, so it simply shouldn’t matter whether he is dead or alive. I would like to dedicate this post to those people who think like that. Personally I’m a technology enthusiast. I live and breathe computer and all things tech. I like Apple products but I have never used one. (I tested a few MacBooks but never really owned one) But I still mourn the death of Steve Jobs. Simply because he was an inspiration. From aspects far beyond than just business and innovation, he is an idol. 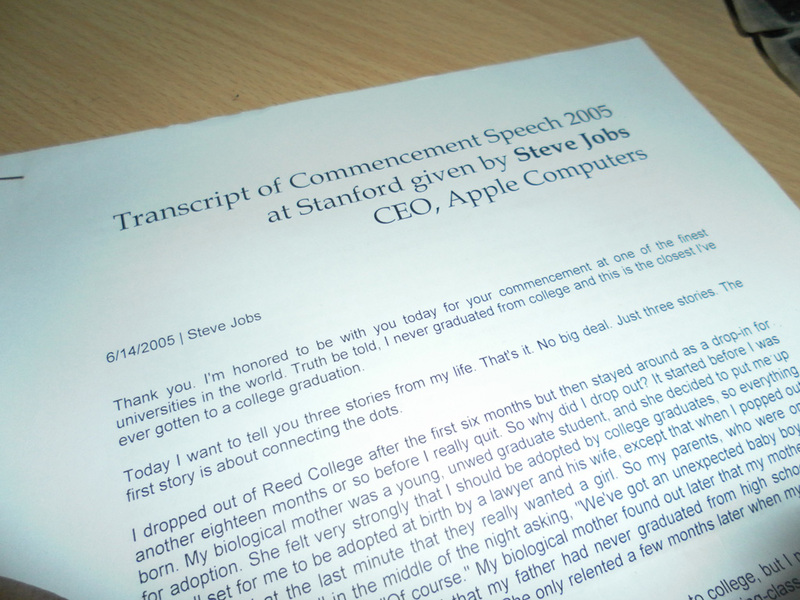 When I was in school, a fan of Steve Jobs and Apple products showed me a clip of the Commencement Speech of 2005 at Stanford University (the full video of which is today featured on YouTube homepage). Back then I wasn’t a good listener to English speeches. So I Googled for a transcription of the whole speech. I was lucky enough to find one quickly. Then I saved it on my local drive, copied it to a flash drive, carried it to a shop to get a print out of it. It took 3 pages in small font. I read it a couple of times. He delivered the speech in very plain English. Even for me, who wasn’t very well in English, it was pretty easy to understand every bit of it. It was full of true stories, full of advice (in both direct and indirect ways) and full of life. I enjoyed reading it. I was so attached to it that for a moment I felt like I was right there among the students sitting in front of Steve Jobs at the 2005 commencement. These three pages contain so powerful and strong inspiration that you can use to completely build up your life. It says to follow your heart. It says not to settle until you find the work you love. It advises you live your life; not someone else’s. It teaches you to treat every day as your last day in the world so that you can avoid yourself from doing things that you would not do if you were to die that day. Of course it was impossible to connect the dots looking forward when I was in college, but it was very, very clear looking backwards 10 years later. Again, you can’t connect the dots looking forward. You can only connect them looking backwards, so you have to trust that the dots will somehow connect in your future. You have to trust in something — your gut, destiny, life, karma, whatever — because believing that the dots will connect down the road will give you the confidence to follow your heart, even when it leads you off the well-worn path, and that will make all the difference. Remembering that I’ll be dead soon is the most important tool I’ve ever encountered to help me make the big choices in life, because almost everything — all external expectations, all pride, all fear of embarrassment or failure — these things just fall away in the face of death, leaving only what is truly important. Remembering that you are going to die is the best way I know to avoid the trap of thinking you have something to lose. You are already naked. There is no reason not to follow your heart. The last one might look a bit awkward, but that’s more powerful and meaningful than the previous three if you can understand what it truly means. If you’re interested to read the full transcript, click here. We know Steve Jobs reinvented the way the world works. Some might argue that those products are only for rich people, well they still changed the way the world works. For example, think about the iPad. More or less it comes in use for people. If you can’t get an iPad because of it being expensive, you might want to get a tablet device from other vendor, like Samsung Galaxy Tab or Acer Iconia or anything. But if there were no iPads, I’m afraid there wouldn’t have been any of those tablet devices as well. Steve invented the era of tablet devices. And he could see how useful it would be even before the device was designed. Think about Floppy Disks. Apple was first to drop Floppy Disk from their computers. Back then, it felt awkward. I mean, how could you throw away a drive like that? I couldn’t see, but Steve Jobs was able to see that there will be a time when Floppy Disk won’t find its place in trashcans. If you know anything about Apple products, you would know that they are always innovative. They reinvented the way we listen to music. They reinvented the way mobile phones work. They reinvented the personal computer. They reinvented the technology. And most — if not all — of these reinvention came from the ideas of Steve Jobs — well, so far. So far I have been talking about things that doesn’t have anything to do with his business. You see even if we don’t use these products, we could use his words as an inspiration and light up our own life. There’s always something to learn from a successful person. You didn’t need to see his face. He was a man you could recognize from his shape. He will live. He may have passed away. His body is gone. We will no longer get new ideas and quotes coming out of his head. But what he has said and done will keep him alive for centuries to come. No invention gets forgotten. Many medias today are comparing him with Thomas Alva Edison. Why do we still remember Edison? He invented light bulb. And that was an invention so big that he will be remembered forever. Talk about Charles Babbage. What did he do? He invented Analytical Engine that most of us haven’t even seen in our entire lifespan. But he is considered the father of the computer. Because he reinvented the way people used to think about computers back in his days. Even though his engine is of no use today, we remember him and he will hold his position in the history forever. Steve Jobs was no different. He reinvented a lot of things. We don’t know what the technology will be like a century later from now on. Maybe people will get shoes that can fly. But still those people will remember Steve Jobs. He will never be forgotten. And a man who is never forgotten cannot be referred to as dead (unless formally). He will live. He will live through his inventions among Apple fanboys. He will live through his strong inspiring words among those who took him as an idol. He will live through his inventions among other companies who followed his idea and came up with their ‘personalized’ version of the same product. He will be remembered. And he will be missed. That’s how you know you don’t have to own an iPhone to miss Steve Jobs. He had a greater impact on the world than you thought he had. Steve, it was way too early for a man like you to leave. And one more thing, Rest in Peace. Thanks. I figured it looked better with that photo so I moved it to that photo as a caption. An amazing post and beautiful tribute to a truly amazing guy. He really has made a difference in his life and will always be remembered for it. Was deeply saddened to hear about his death this morning. My niece is a huge fan and was gutted about him stepping down from apple. She is only 13 and even she raves about him. R.I.P his legacy will always live on. I was shocked this morning, too, when I heard about his death. Things happen so quick. We use Apple products a lot, so it’s truly a sad day to lose such an amazingly talented guy. I don’t. Still I’ll miss Steve Jobs. And you already know why. Yes, his vision has changed the world in which we live in. His simple understanding of a problem and applying simple solutions to improve make him a legend. It is a shame he has to go so soon and at a young age. But you are right, his work will continue and no doubt will inspire the next ‘Steve Jobs’ to change the world once again. I have the same opinion like you. He shows the way, that’s why he is the most forward. And he will be remembered through his works and inspirations for decades to come. E m p t i n e s s . . .
He’s a truly genius human being. Like you, I don’t own any apple products but I did realize how apple products change the computer industry. Its like apple is the teacher and all the other students are just the students. PS: I just want to add that tablet devices have been invented around 80’s, I think ,but it didn’t pursue because people was reluctant. Steve Jobs relive the idea of tablets devices. I remember the moment of reading about Steve Jobs death vividly; it was as if a father-figure died. Almost cried. I’ve followed Steve Jobs chronology since knowing that following one’s passion is the only true way to live a life worth living. Thanks for your comment. I’ve followed most of his keynotes whenever an Apple product was released. He was amazingly talented, incredibly creative and vividly inspiring. “I like Apple products but I have never used one…But I still mourn the death of Steve Jobs. Simply because he was an inspiration.” ~ I completely agree with you. I don’t own any Apple products, but I think that his passing is such a loss…he was a true inspiration to so many people, not just techies. Thanks. I find him as an inspiring person, too. people come and go but only a handful manage to leave their mark…. And Steve is one big example of that.